Paint the clothespin green and let it dry, opening it periodically so the clothespin doesn't permanently stick together. Glue googly eyes to the top of the clothespin. Fold the green construction paper approximately the width of your clothespin (mine was about 0.7cm). The "body" of my alligator needed to be approximately 6cm long, and I left room for a tail. Draw spikes above the crease in your paper, and a tail under the crease. Cut out and glue onto the top of the clothespin, behind the eyes. Don't glue the tail. The spikes will be on the body, the tail will hang off the end. Draw teeth on white construction paper, using your clothespin as a guide for width. Glue the base of the teeth to the end of the clothespin, letting the tips hang down. Let glue dry. You're done! I got this idea when C and I were playing with a basket of clothespins yesterday and I was making some clothespins "nibble" her sleeve. 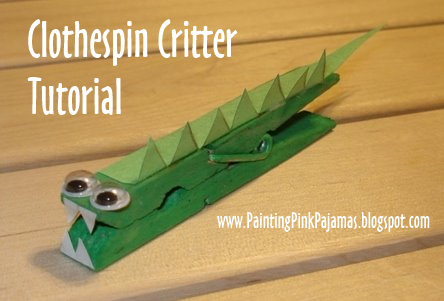 Let me know if you make any different kinds of clothespin critters; I'd love to see them! That's seriously the cutest idea! I love it. Sammi loves alligators! We're definitely gonna do this one :) Thanks for sharing. Thanks for this great idea! I love it, and my pupils too!!! :) and thanks for sharing! Hi, I'm Kirsten! 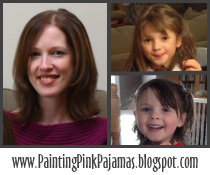 Join me and my daughters as we sing, read and play our way through their pre-school and elementary years. We'll be sharing our favourite books, music, recipes and activities. Big Sister (previously referred to as C) is 7 years old, and Little Sister is 4 years old. Oh how the time flies! Disclosure: Amazon links are affiliate links. Thanks for using them! Puddles and icicles and potholes, oh my!